Mr. A wanted to move into analytics badly. He had left his job and wanted to focus on learning analytics. He had been reading on the subject for some time now and was convinced that this was his calling. When he reached out to me, he asked what, where and how should he start learning about Analytics. I suggested him to start by taking up a course on edX / Coursera and make sure that he completes all the assignments. When I checked back 3 months after our discussion – he had registered for at least 5 courses Online – completed none, got intimidated by the vast knowledge he needed to gain to make a career in analytics. He was probably more confused than what he was, when he started his journey. K was an experienced analyst with a big retailer. She had 6 years of experience, but all of it on SAS. She wanted to learn a second (and open source) tool. I thought this would be easy for her. She had a lot of experience in the field and just needed guidance on learning a new tool. I laid out a learning path for her and thought she would take it from there. When I checked a month after our discussion, she had not written a single line of code in R or Python! In these scenarios (and many more like these), people knew what they should be doing and probably had the intention to do it at some point. That is why they would have reached out to me. But they faltered somewhere during the journey. They couldn’t convert their chances even after being in a position to do so. The problem here was not that people didn’t know what to do. They very well knew what was to be done. The problem was that of implementation and execution. And this is an equally bigger problem. Since, I have not addressed this issue directly in my posts till now – I thought, I would do it now. This problem is some what similar to that of training yourself at the gym – you know the benefits of training yourself. You also know what needs to be done – but still only a few of us are able to train ourselves at the gym regularly. The key to solving this problem lies in taking small and focused steps with clear mind. The solution lies in taking the first step rather than questioning whether 15th step would be right or not! 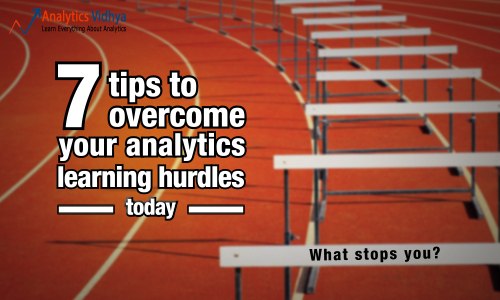 Here are a few tips, for people who face challenges in executing their analytics learning plan. Start out easy (but do start) – This is probably the biggest problem people face – they just don’t start. They know what to learn and where to learn – but they still don’t start learning. They keep searching for more content, more resources – but don’t start with what they already have. Don’t look out for that perfect book or course – just start with what best you have access to. Log on to any MOOC and start learning the subject. Nothing beats action bias! While you start, start easy. Look out for simple solutions. If you have to install a software – look for an executable rather than compiling the code yourself. If there is a GUI version of a tool available – learn on that first. e.g. When I started learning SAS (my first analytics tool apart from Excel), I decided that I’ll use SAS Enterprise Guide – it has a GUI interface and I don’t need to learn the language from start. Once I grew more comfortable with the language and interface, I started picking up the code on the side. This made the process far easy for me. Define learning objectives clearly – You might face this challenge as soon as you start learning. You start with a video on Business Analytics, find out a term “Business Intelligence”. Next, you search for Business Intelligence and before you know, you are actually watching a tutorial on Tableau! This is the problem of plenty. You need to clearly define what you want to learn and focus only on that. One practice, which has helped me well to do so, is to define these objectives clearly at the outset. Not only do I define what I want to learn, but I also go to the extent of what I won’t learn. For example, when I started learning Python – I had committed that I want to learn Python only for data analysis and not for other purposes (e.g. Web development). Set aside some time – The best way to make sure that you learn daily is to set some time aside. It could be early morning, lunch time at your office or once you are back from work. But set a time aside for your learning and follow the routine. Soon, your mind will become accustomed to learning at this time. Take one problem, one tool and one technique to learn at a time – Don’t over commit yourself. Quite a few starters I meet promise to learn R and Python in next 6 months. My only advice to them is to pick only one tool. Most of the things which R can do, Python can do them as well and vice versa. By learning both of them simultaneously, you will become good in none! Similarly, learn one technique at a time and work on one problem at a time. Focus on your strengths – If you know that you enjoy reading – find the right book. If you don’t enjoy coding – start with a GUI tool. If you learn best late at night – learn at that time. Idea is to make learning as simple as possible. Take all the hassle away and just focus on learning. Do not rationalize – If you were not able to deliver on your learning plan – watch out! Your mind can quickly come up with rationalizations – why you couldn’t learn as much as you thought? Don’t give in to these rationalization. Accept that you failed and start again – but don’t start the blame game. Don’t blame your manager for the extra work or your family for extra commitment – find out a way and start learning. What do you think about these tips? Have you faced similar problems, while executing your learning path? How do you overcome them? Are there any other tips you can share with us, which can help our audience learn faster. Hi Kunal, making a career shift from auditing to analytics, I find these kind of articles by you to be very insightful and encouraging. Currently, I am pursuing SAS certifications- base sas , business intelligence and predictive modeling. When I had started I was very enthusiastic about learning all these. During the course, understanding concepts(technical/statistical etc), coding n all was becoming too much. At some point I even questioned my self that is this the right field for me? My zest for knowledge and make a mark in this field has kept me going n now I know there is no looking back. I will definitely pursue n complete what I have started and continue learning at every opportunity I get. Way to go Sheetal! Keep up the good work and feel free to share your experience with others in the same boat. I have already cleared global cetification for base SAS 9. Currently, preparing for BI and predictive modeling. Incase if u need any help, let me know. I am planning to attempt base sas certification in coming month. Could you please help me with my preparations. If you have prepared some notes for your SAS base programing certificate and your comfortable sharing them, please email it to me on [email protected]. I have a total work experience of 8.5 yrs. I learnt SAS and completed certification 2yrs bacj. Since I did not have work experience in SAS, I was not able to get a job in this field. I am currently working as an Assistant Manager in MIS reporting with 5 yrs experience and also involved in automating reports with Vb macros. I am looking to upgrade my skills in analytics through an online course. I am not specific in terms of the tools i want to learn. Kindly advise on what course I can enrol to which would also helpme make a job change. Did you undergo the base SAS certification? Or a predictive modeler certificate? In order to make a transition from BI / MIS, you should focus on learning Predictive modeling and the associated certificate. You can look at doing foundation courses from Jigsaw Academy or take up programme from ISBs / IIMs / Great lakes. Thanks for the article, these things we all know but never focus on. I myself have committed some of these mistakes. Practical solutions to learn not only analytics, but anything that we wanted to do newly. Thank you Kunal. I remember my Professor’s quote, in an Information Era the challenge is not learning but how to learn!. You type a key word you get thousands of references/study materials on the web and we end up reading the same few initial lines in all the links. Loosing focus and jumping topics are the other symptoms of this .No doubt, information surrounding us is getting saturated(experts call it as information Tsunami) and it’s a timely wake up call from you Kunal. You have neatly explained How to learn? In addition to the above 7 points i have 3 more points which can also help budding Analysts. 8.Techno-Functions: Going forward Analysts role will be more of Techno-Functional in nature. A Techie should show interest in Business and Business guy should learn Technology to some extent. 9. Develop friendship with Numbers and understand the importance of it. You must always carry your company’s numbers on your finger tip(say overall revenue, your unit’s revenue, Profit, Margin, and your Biz KPIs ). You can add value to your work when you know your competitors numbers on a high level. Read Annual Report to understand the company, go through dashboards/KPIs to understand the business unit. 10. Presentation: You might discover some hidden gems from your data, but it’s of no use if you don’t know how to present it to the Decision makers. Analysts are not the decision makers instead they influence the decisions. That said, Presentation is neither science nor Maths but it is purely an art work. There are few rules about color combination, real estate positioning of charts/dash board objects etc. you need to practice it couple of times. That’s it! Thanks Shashi for those pointers. I am new to the analytics field. I have started learning Hadoop. Please let me know which language should I learn, Java or Python to work with Hadoop. Both these languages would be new to me, and I have heard Python is bit easier to learn as compared to java. So please advice me whether Java or Python, which should i start learning? Java is the right choice for you. Python is easier to learn, but the Big Data ecosystem is far more evolved on Java rather than Python. If there is one language you want to learn to use Hadoop, it should be Java. I started my career on Tableau(BI). Right now i’m working on this, I am very enthusiastic about learning all these. I am looking to upgrade my skills in analytics. I’m willing to learn new tools.Kindly advise me. & now want to enter in analytic field. I have completed Base sas global certification and pursuing Adv.Sas but now days I realize that it’s difficult to getting job. I have already registered many job portals but not getting any call back. can you suggest me what was the other way to enter in such field.Kindly advise me. You can continue to apply your learning on various platforms like Kaggle competitions and other datasets available in the open. There is a preference for people with hands on experience and chances for getting shortlisted would increase. Another way to enter into Analytics, I would recommend doing Post Graduate Programme from Praxis Business School, Kolkata. It is probably the only one which takes ownership to solve for placements of students by its industry tie-ups. You are fresher, this is a good choice to get into Analytics. Guilty of #5. Have been all the algo but practicing none for last 3 months. I realized the mistake and hoping to not repeat it. Thanks Kunal ! Well written article. i would be very thankful if you tell me what to do to get job as data analyst….. I really appreciate efforts you make for betterment of the field as well as guidance to people. It clearly goes to prove your zeal and clarity of thoughts regarding the domain. a) What is the correlation between Actaurial and Analytics field? Should I continue studying Actuarial and switch to Analytics after a brief experience in former domain? Shoul I earn some certification in Data Science such as SAS, R, HADOOP ..etc? c) I know this question is vague on my as well as your part to answer. But, on a lighter note , how monetary lucrative is the Analytics field? It would be greatly appreciable if you could answer this with some of the figures as I need to evaluate my oppurtunity cost in terms of other careers. Please help . Thank you in anticipation. Good question regarding actuary & analytics correlation, actually I also have this very doubt when I recently saw a job description of Mc Kinsey for the role of Junior Analyst. They quoted this in their requirements “At least 2-4 actuarial exams, preferably CT4, CT5 and CT6”. The complete JD is emailed to your for reference. Please check, it might help you to decide. Your writings always inspires me. Thanks for pointers, I will inculcate some of the tips you suggested above in my learning of Analytics. Very realistic and well written …Thanks! Just now, you became a helping mind for many…!! And the things which you pointed was not only applicable for analytic’s but this was meant for all technologies. Good One. I hope at-least i will realize now and follow what you said. I can relate to different mistakes that Kunal has mentioned in the article – since I have committed most if not all of them. But with constantly catching myself doing the mistakes and correcting them, I can sense that I am getting more and more comfortable with the concepts and numbers. One method that has really worked for me is find others who are interested or curious about Data Analytics and teach them what I learned from MOOC or other readings. This is the best validation of my learning – the False Positives and False Negatives of my learning.